Junior Typist and Stenographer jobs. There are 24 vacancies available in Kandhamal District Court vacancies recruitment. Applications will be received in a prescribed format only. Last date for submission of applications to District Court of Kandhamal is 02-December-2017 by 05:00 PM. 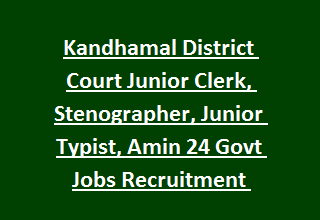 Selection for Kandhamal District Court Junior Clerk, Stenographer jobs will be through Skill/Typing Test and Written Test followed by Personal Interview. Age limits, Selection Procedure and more details of Junior Clerk and Stenographer Jobs of Kandhamal District Court is given below. Application form submission last date is 02-12-2017. Available vacancies in Jagatsinghpur District is 24. Post Name and available vacancy details are given below. For all the posts candidates must have at least passed Diploma in Computer Application from a Recognized institute. Selection for this Kandhamal District Court jobs recruitment will be through Written Test, skill test/type testing and personal interview. Download application form from Official Notification of Kandhamal District Court which is given below. Fill all the required information and attach the self attested copies of caste certificate, educational certificates, fee payment slip and if any other. Along with application attach two self addressed Rs.5/- postal stamp covers. And send the application to Kandhamal District Court to be reachable on or before 02-12-2017 by 05:00 PM. One Cover letter mention the "APPLICATION FOR THE POST OF -----------------------". Application form is available in official recruitment notification of Kandhamal District Court. Filled application form has to reach District Court of Kandhamal is on or before 02-12-2017.